“Scossa” is a vessel built for Alilaguna S.p.a. by the Vizianello yard, in collaboration with the nautical division of Siemens Italia. It is propelled by an electric motor and can sail under electric power alone for about four hours. 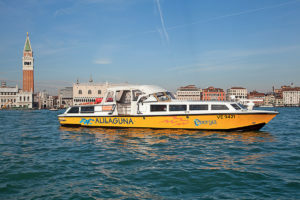 Alilaguna, the Venice public transport company, together with boatbuilder Cantieri Vizianello has asked Siemens to create a propulsion system using technologies already tested in the automotive sector and adapted to the marine environment, thus offering a possible solution for the entire fleet of small vessels. The project, part of a drive for sustainable mobility, has as its main aim the reduction of fuel consumption with an important reduction in atmospheric emissions, in addition to a drastic cut in sound pollution, favouring silent running on the water. Almost 15 m overall and 3.2 in the beam, the “Scossa” can carry 40 passengers with space reserved for the disabled. 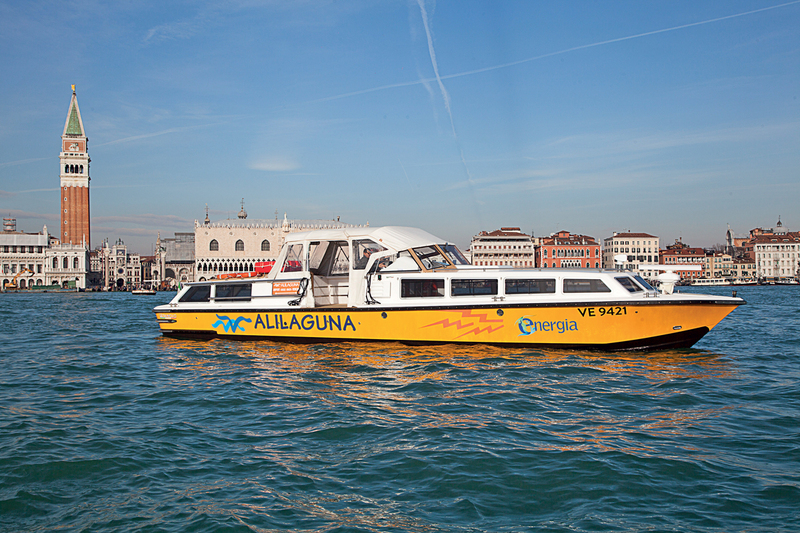 The innovation from Siemens concerns the method of propulsion: the vessel is powered by a main electric motor inside the hull which in its turn is powered by a series of batteries designed to operate along the local public transport route in the old centre of Venice (along the Canal Grande), recharged by a generator when outside the old centre. In this latter area the vessel will pass from a “100% electric” condition to a “diesel-electric” condition. The electric motor can also carry out a wide range of complex manoeuvres, thus permitting use of the vessel in complete safety. Scossa reaches 30 km an hour in the open lagoon – using the power of the diesel engine that generates electrical energy – but only 5/7 km per hour along the canals, powering the electric motor with the energy stored in the batteries. The indirect advantages of the lack of noise and vibration concern not only the reduction of emissions and, as a result, of pollution, but also a minimising of waves while maintaining manoeuvrability and safety. While the use of “green” solutions is already widespread in the cruising sector, in particular in small boat fleets it is limited to sporadic examples: in fact few boatyards have a production line completely dedicated to vessels with low environmental impact. So evolution is limited, without a market to boost it, because the use of traditional propulsion methods is still held to be more profitable and, erroneously, more economic. Scossa uses technologies that have already been tested in the automotive sector and adapted to the marine environment, setting a good example and, above all, providing an effective response to the growing problems of limiting environmental emissions, setting itself up as a point of comparison for small pleasure boats. “It’s like going on a sailing boat, but above all it’s an act of love towards the city where we live and work,” says Fabio Sacco, President of Alilaguna. “For this reason we have been involved for a long time in creating zero emission, eco-compatible boats. With Scossa we are inaugurating the first vessel of a new generation and we are already ready to build a second. The vessel, which cost €700,000, will be used on the Alilaguna Orange line sailing along the Canal Grande in electric mode between Ponte delle Guglie and Piazza San Marco”. The vessel is driven by a 180 kW Siemens electric motor running at 3000 rpm, powered by 32 VALENCE XP18 batteries of 19.2 V connected in series to give a total voltage of 614.4. The maximum speed of rotation of the motor is electronically limited to 2700 rpm. Along the shaft is a CENTA elastic joint that connects the motor with the ZF 286 A reducer/inverter that reduces the rpm by a ratio of 1:1.962. This element also inclines the shaft downwards by 7°. Then there is a homokinetic joint with an AQUADRIVE CVB 42.30. Then comes the propeller bearing shaft about 3 m long and 70 mm in diameter that passes through the stern gland and the casing, finishing directly in the water. Close to the propeller is a support with bushing. The propeller is a model B7 RADICE with a diameter of 720 mm, a P/D ratio of 0.9, a stroke of 648 mm and an expanded area/disc area ratio of 0.687. Taking account of the maximum RPM of the electric motor set to 2700 and the reduction ratio of 1.962, the rpm of the propeller will be about 1376. There is also an SISU 74 CTIM internal combustion diesel engine developing 200 kW at 2200 rpm (equal to 272 hp). This is completely disconnected from the propeller shaft and is used to generate electrical energy coupled with a Siemens machine that is completely identical to the propulsion motor. The mechanical energy produced by the diesel engine is used solely to drive the Siemens generator, passing through a STIEBEL multiplier with a ratio of 0.706. The fuel reserve is placed at the stern and is the only tank containing liquids on board. It holds about 600 L.
Values and care shared by Siemens, which continues to make sustainability not only one of the great factors in the success of the company, and so of its customers, but also a long-term company strategy. In addition, the Marine sector and its technological evolution are followed with particular attention by Siemens in its industrial divisions and markets.